The Boston Bruins season is over and season grades will begin. 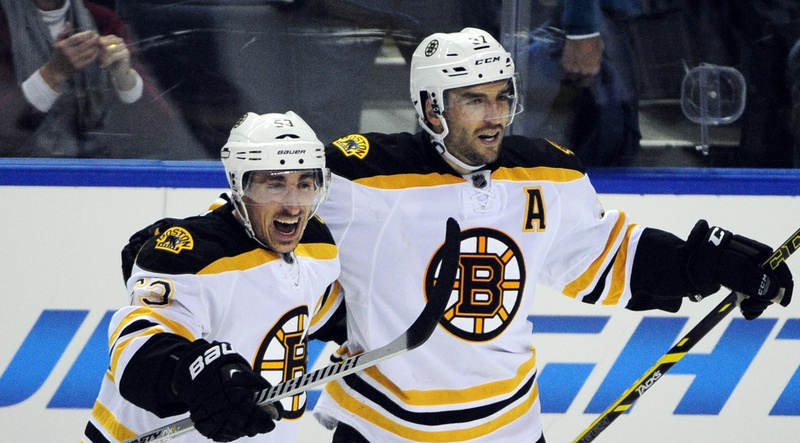 We start with two integral pieces to the Black and Gold’s playoff run – Patrice Bergeron and Brad Marchand. Bergeron had a solid season for the Bs, but he lacked consistency offensively. In the 2015-2016 campaign,Bergeron had the best season of his career, tallying 32 goals and 36 assists. However, this season saw those numbers drop to just 21 goals and 32 assists. When it came to defense however, Bergeron shined. For the sixth straight season Bergeron was nominated for the Frank J. Selke Trophy which goes to the best defensive forward in the NHL. He has a chance to tie Bob Gainey for most Selke Trophies in NHL history. Bergeron also shined in the face-off circle. He led the league in that department with 1,089 face-off victories. Marchand’s play from October through March was fantastic. The Bruins left winger had the best regular season of his career thus far. He ended the season with a career high 85 points which was the sixth most in the NHL. He also finished the season with a career high 39 goals, leaving him one shy of becoming the first Bruin since Glen Murray (2002-2003) to score 40 goals in a single season. Marchand had a very productive regular season for the Bruins, but his play in April ultimately doomed their chances at a Stanley Cup Run. Marchand was suspended for the final two games of the regular season for spearing a Tampa Bay defenseman. The penalty was foolish and could have easily been avoided. As a result, the Bruins were without their best player to close their playoff push and were unable to clinch home ice advantage. He had a chance to redeem himself in the playoffs, but he didn’t deliver for the Bruins. Marchand struggled mightily in the post season and only managed to score once. Not only did Marchand struggle to generate any offense, but he also continued to take foolish penalties, putting his team on the penalty kill far too often. Marchand is undeniably the Bruins best player, but he lacks the leadership qualities that a team MVP should have. They will need him to embody better leadership qualities if they hope to breakthrough to the Stanley Cup Final in 2018. One comment on "Bruins Grades: Patrice Bergeron and Brad Marchand"
James. What a magnificent effort! You are making fantastic progress. We have a daily tryst with the website. Keep it up! !